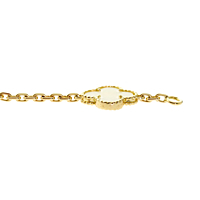 The vintage white coral alhambra bracelet by Van Cleef & Arpels is simply gorgeous. Five, double sided Alhambra designs, made with stunning white coral, are artfully framed in an 18kt yellow gold beaded design. 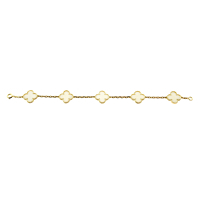 They are connected by a heavy oval link gold chain bracelet with a closed clasp.